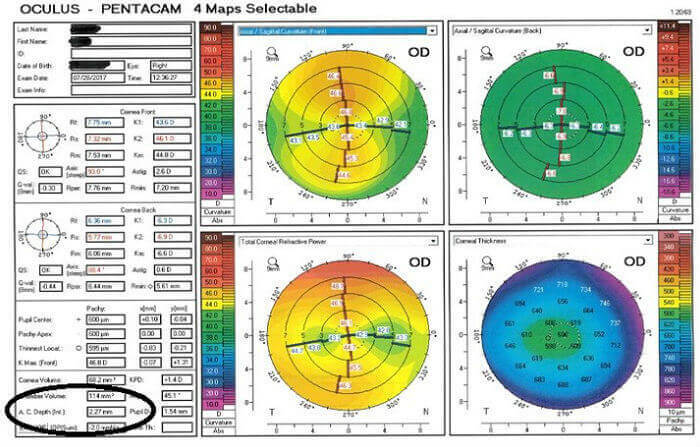 Patient DV, 39 year old audit manager had bilateral ICLs implanted in Spain 7 years ago for myopia and astigmatism. His RE had started to develop an anterior capsular cataract. Bilateral removal of existing ICLs and cataracts, followed by implantation of toric trifocal IOLs. The above was carried out over two consecutive days, RE followed by LE. IOLs used: Physiol trifocal toric. As can be seen from the above table, the patient achieved very good distance and near vision. It is important to ensure sufficient anterior chamber depth before implanting ICL at primary treatment. As can be seen from Figure 1, the anterior chamber depth in this case was 2.17mm. Clinical suitability guidelines state that a minimum of 2.80mm is required for sufficient clearance of ICL with crystalline lens. In the rare instance of ICL induced cataracts, because of the reversibility of the procedure, the lenses can easily be removed by an experienced surgeon.